The many types of metal used in roofing. ALUMINUM ROOFING is a very light metal with a specific weight about a third that of steel. Aluminum naturally generates a protective oxide coating and is highly corrosion resistant making it excellent for such conditions as marine environments. Different types of surface treatment such as anodizing, painting [such as Kynar500 used on metal roofing] can further improve this property. It is particularly useful for applications where protection and conservation are required. Aluminum is 100 perce nt recyclable with no downgrading of its qualities. The re-melting of aluminum requires little energy: only about 5 percent of the energy required to produce the primary metal initially is needed in the recycling process. Metal roofing has a 25% recycled content in new roofing. COPPER : Copper generally comes in 16 ounce [standard] and 20 ounce. The 20 ounce generally more strength and thickness then most roofs would need. Flashings in most cases can be made with 16 ounce copper although with some larger gutters, 20 ounce might be preferred. The advantage of copper is that very few elements will affect this roofing material. Copper is a product that will last a lifetime. Copper roofs can still be found on buildings build over 300 years ago. The natural patina process where the roof will first turn a dark brown and then slowly start turning a patina green. This is a product that actually increases in value as it ages. 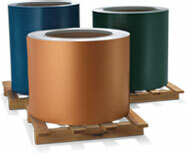 Copper generally runs about twice the cost of galvanized steel. COPPER COATED STAINLESS STEEL ROOFING: All the ageing advantages of copper with the extra strength stainless steel. When looking at this roof, it is almost impossible to tell the difference between a real copper roof and copper coated stainless steel roof. The reason is because the copper coating will age exactly like a copper roofing including the patina ageing the comes over a period of years. The look of copper for about 25% less cost. CORTEN: This product is produced by Ispat Sidbec Inc. and by other various steel mills around the world under the trade names of Corten, Kupten, Triacor, and others. It is a high strength cold rolled steel of architectural interest because after installation and exposure to normal weather the surface, in place, develops a pleasing iron oxide matte finish, which accents the appearance of any building on which it is use. The weathering process that occurs after installation eventually decreases and from that point on the finish acts as a protective coating for the base metal. Like many other architectural products with desirable features, some cautions must be exercised during installation. The roofing sheets are simple to install using the same methods as any other metal roofing sheets. However, care must be taken that the roof drains well so that no residual moisture can be trapped between two or more overlapping sheets. If moisture is trapped, the weathering process may continue where the moisture is trapped and the reaction will not stabilize as planned. The runoff of moisture from these panels will badly stain concrete or stucco. Be careful where the run-off is directed to prevent staining. Also, the fasteners used, either nails or screws, should be of non-plated stainless steel, anodized aluminum, copper, bronze or brass. Zinc and cadmium coated items are not suitable for use in contact with Corten Steel. GALVALUME or ZINCALUME ROOFING: Aluminum-Zinc - Combine the chemical action of zinc and the barrier protection of aluminum. Galvalume was developed by the Bethlehem Steel Corp. and is described in ASTM A-792. This make-up is 55 percent aluminum and 43.5 percent zinc and 1.5 percent silicone. This product was a great improvement over galvanized material. Zincalume is a registered trademark of BPI Steel. STAINLESS STEEL ROOFING: ZT Alloy applied to stainless steel (TCS II) exhibits corrosive resistant properties which exceed that of traditional galvanized steel. This two phase metallic coating is electro protective when exposed to corrosives including: oxygen, carbon dioxide, chlorides or other reducing agents. As a result, ZT Alloy inhibits corrosion of exposed metal anywhere in the vicinity of ZT Alloy. ZINC ROOFING: The raw material is melted, cast and wound onto a steel sleeve in a single continuous operation. The quality of this material is uniform and flawless. These coils are then used for further processing as a universal source material to produce high-quality roofing products, pre-fabricated parts for roofing applications and facade cladding including the necessary building profiles. UNICORE [VMZinc] was first used as building material in Paris, France in the 1800's, as part of Baron Hausmann's rebuilding program. Today 85% of all metal roofs in Paris utilize zinc. Unicore is the world's leading producer of architectural zinc has been business for over 160 years. RHEINZINK is a trade name for titanium zinc, manufactured to DIN EN 988. Electrolytically refined zinc with a 99.995% degree of purity as defined by DIN EN 1179 serves as the basis for the alloy, which also includes small yet precise amounts of copper and titanium. The composition of the alloy is one of the factors determining the technological properties of the material – as well as the color of the RHEINZINK patina.